Custom Designed Systems - EnviroPower Renewable Inc.
Metso is a global mining and energy equipment company with a great deal of experience in the design, manufacture and installation or rotary kilns for use in mining, mineral refining and waste to energy. EPR has teamed with Metso to deliver custom designed waste to energy plants for a client in the Caribbean and for recovery of aluminum from industrial waste for a client in the continental US. Design of custom systems starts with thorough analysis of the available waste fuels as well as analysis of both recovered product and residual waste. These studies are carried out by EPR scientists in co-operation with the Materials Sciences and Engineering Laboratory at the University of Washington. Preliminary engineering designs are developed in cooperation with manufacturers such as Metso with final engineering design by EPCs such as Amec Foster Wheeler (now Woods Group), Sundt Construction and others. The image at the top of the page is a Metso dual kiln waste to energy plant in China. 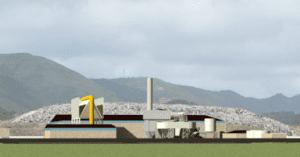 The middle image shows the preliminary design for a waste to energy plant for St. Maarten. The bottom image shows the exterior of the custom designed of the St. Maarten plant enclosed in hurricane resistant structures. Rotary kiln gasifiers inherently wide ranging of operating conditions allows them to be used for recovery of valuable materials from a variety of waste streams. 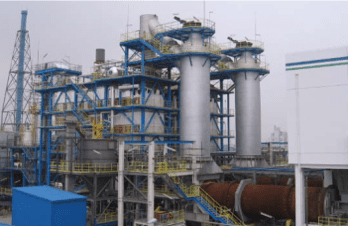 Examples include recovery of cementitious materials from coal fly ash and recovery of metallic aluminum from mixed wastes from aluminum recycling plants.